New York’s Rag Trade – a trade no longer. She moves with a dancer’s ease and grace. It becomes a compelling performance as you see her go in and out of the clothes’ racks lining the showroom she now shares with other designers. Pulling out one outfit after another from her autumn collection, her clothes are a reflection of the woman herself – an overwhelming impression of understated elegance. Hints of Givenchy, Chanel and Yves St Laurent at their prime combined with a dash of something new are evident in these clothes. Attention is given to the smallest detail; the cut, the choice of fabric, colour, as well as the embellishments that are buttons, alternative fabrics, and appliques. Additions, that don’t take over but rather enhance the creation. Her name is Ildi Marshall and this woman is an artist. She has that kind of cream pot skin for which sun kissed Australian women would sacrifice their eye-teeth, a dancer’s trim figure and wears a simple black frock to perfection. I listen to her story, a personal story covering four decades working in the fashion business, and therefore reflecting the ups and downs of the rag trade in New York. Every now and then I wonder how old she is, but deem it too rude to ask. At the height of her business, she had 3,000 square feet in which she employed over 30 people. These were the days when the New York designers did more than just design clothes. They employed people who cut, sewed and finished their garments as well as marketed and sold them directly to the department and smaller stores that attended the biannual shows. We are on a tour of the garment district and I could sit in the gutter and weep. From 6th to 9th Avenues, from 30th to 40th Streets we walk. The streets are now deserted. Shops that once sold fabrics and accessories to the rag trade are empty with for lease signs hanging in the window. Accompanying legal notices warn that nothing is to be taken from the store. So they sit there with stock still on display and a pile of correspondence growing each day. There are the occasional stores that are still open for business. They are a reminder of what once was. It is like walking through a living history museum. In streets that used to be so full of people they were impossible to drive down, it is easy to imagine how it must have been. Streets clogged with clothes racks bulging with garments in their various stages of manufacture, covered in clear plastic to protect them from the elements, the hustle and bustle, the noise and the sheer electric excitement that was the daily experience for all workers in the garment district at a time when it was at its peak. It was the busiest part of New York. Immigrants, mainly Jewish and Italian, then Hispanic and Asian, could get a job in the rag trade. You don’t need to speak English to be able to use a sewing machine in a sweatshop or launder the finished product. The history of manufacturing in the United States is reflected in the garment industry. It was here the first big struggles were waged in the policy areas of occupational health and safety, social security, minimum wages and the like. In 1911 there was a fire at New York’s Triangle Waist Shirt Factory and over 140 people, mainly teenage migrant girls, were killed. This incident is still remembered every year with a ceremony that includes the victims’ names being read out. Close to the end of their shift one Saturday afternoon in a factory that had wooden floors covered with scraps of fabric discards, and mixed with oil from sewing machines, a spark caused this floor ‘fuel’ to ignite. When the girls tried to escape they found the fire escape doors were locked. In 1911 fire engines didn’t have ladders that extended to the 8th floor and above. The girls who worked on the 8th, 9th and 10th floors jumped to their death in scenes reminiscent of 9/11. There was a huge public outcry. 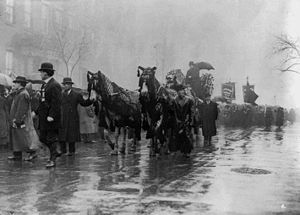 100,000 people marched in the funeral procession and 400,000 people lined the streets. The first occupational health and safety regulations were introduced as a result. In 2000 a fire broke out in the Chowdhury Knitwear factory in Bangladesh. Forty-six girls were killed. They were aged between 12 and 14 years. When the investigators went through the charred remains of the factory they discovered that the fire escape doors were locked. This factory’s output was for American designers and subsequent sale in the American market. The 20th century that chronicles the garment industry’s rise and fall starts and ends with sweat shops, teenage girls and fire. The story of the 90 years in between is a remarkable one. New York was not built on banks, advertising agencies, the investment and securities’ market, but on the blood, sweat and tears of the garment industry. 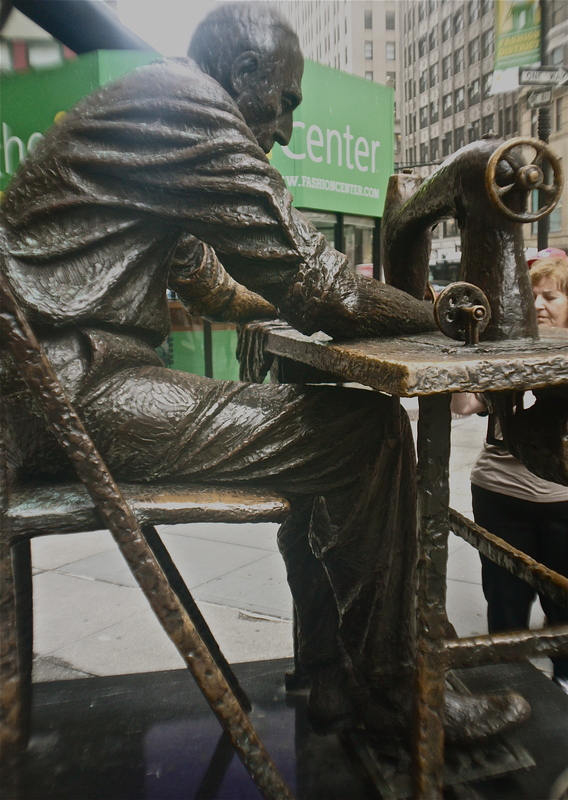 For over a century the garment industry was the single largest employer in New York. This industry’s importance to New York cannot be overstated. In 1965, 95% of all clothes sold in the USA were made in the USA, 3/4 of which were made in New York. In 1975 the percentage of all clothes sold in USA being manufactured in USA fell to 87%, 1985 – 70%, 1995 – 50%, and in 2009, a miserly 5% . The rag trade is a microcosm of the policy initiatives that have facilitated the demise of the American industrial base. The result is an economy that is now dysfunctional and a middle class that is fast disappearing. Aspirational politics has no answers. For the first time in American history the middle class face the prospect that their children will not do better but fare worse than the generations that have gone before. Ildi Marshall reflects the garment industry’s last four decade history. She now works as a one-man band. She designs and cuts these beautiful garments, sending them out to one of the few sewing and finishing manufacturers left operating in the area designated by the City Council as the garment district. This industry has gone from a cottage industry to a full manufacturing industry and back again. Ildi complains about the value of the US dollar doing terrible things to the purchase price of the fabric she gets from Italy and France, the loss of competition in choosing a manufacturer for sewing and finishing, the lack of choice and quality of fabric and accessories available locally and the disappearance of the skilled trades essential to her business. But she continues on producing beautiful clothes. She not only has the genius but, more importantly, the passion that comes with talent. Between you, me and the gate post, Ildi Marshall is 74. Posted in Food, Politics, Sport, Kitchen and tagged Garment District, Ildi Marshall, New York Garment District, New York Rag Trade, New York stories, Triangle Waist Shirt Factory fire 1911. Bookmark the permalink.